We were thrilled to visit another course on the Bagri Foundation Open Programme at The Prince’s School of Traditional Arts last week. With Iranian artist Farkhondeh Ahmadzadeh, students examined the dazzling Patterns of Shiraz, the City of Poets, addressing selected patterns in mosques and madrassas in the Iranian city. Shiraz is one of the most significant cities in the medieval Islamic world, celebrated as the ‘heartland of Persian culture’ and the Iranian capital during the Zand dynasty (from 1747 – 79). It is commonly called the “city of poets” with graves of Hafez and Sa’di, both major pilgrimage sites for Iranians, but it is also well renowned as a city of wine and flowers as well as being home to some magnificent mosques. Two frequently visited mosques are the majestic Vakil Mosque and the Nasir-al-Mulk Mosque, which were both particularly addressed in the Patterns of Shiraz course. Drawing inspiration from the stunning patterns in Shiraz’s Islamic architecture, the students on the Bagri Foundation supported course, looked at how to create compositions from 4 and 8 folded geometry shapes. The students learnt how to develop these using a compass and a straight edge, tessellating them and creating their own pieces. 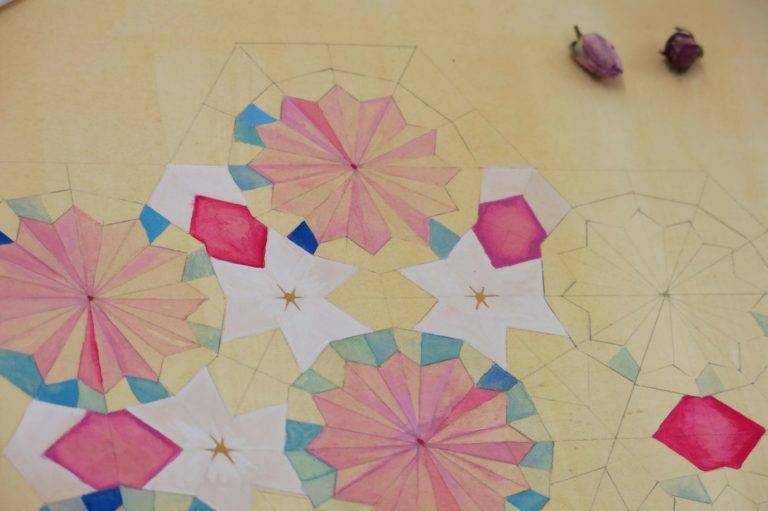 Students began with drawings and using colour pencils and pens and then progressed to learning how to create the ‘glow of Shiraz’ as Farkondeh described, and create dazzling, symbolic colours with natural pigments. Persian poetry was played throughout the course and the students looked at photographic examples of Shiraz’s Islamic architecture as well as depictions in Persian manuscripts. View the gallery of photos from the Patterns of Shiraz course here. Farkondeh Ahmadzadeh is an artist who specialises in the disciplines of Persian poetry manuscripts, sacred geometry and Persian miniatures. She has worked both as an academic and an artist in Iran, America and Europe. Patterns of Shiraz was supported by the Bagri Foundation as part of the Bagri Foundation Open Programme at The Prince’s School of Traditional Arts. This programme aims to develop Asian arts courses at The School. The next course will be on Japanese Woodblock Printmaking.